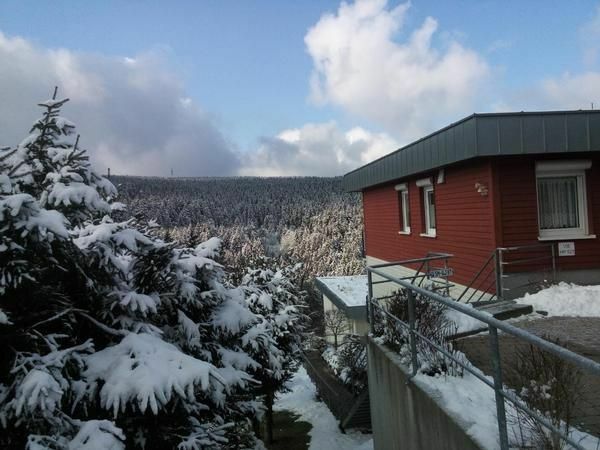 It is a 2005 completed 3-room apartment with living room and fully equipped comfortable kitchen, 2 bedrooms, a spacious bathroom (tub with separate shower facilities, washing machine, dryer, toilet), another guest bathroom and a large south-facing balcony with stunning views over the Thuringian Forest. The apartment is in a central but quiet holiday house with 6 apartments. She has 2 private garages, front of the house. The apartment is after 2 (front door) steps from the street to reach at ground level. General: kitchen (4-burner stove with oven, dishwasher, refrigerator, microwave, toaster, coffee maker). Living room (sofa bed, TV with DVD, books, games). Bathroom (bath with shower enclosure, toilet, hair dryer, washing machine, dryer), sep. Guest toilet. large balcony with balcony furniture. There is also wireless Internet access. Visitor's tax: on the spot. Heating and electricity: included in the price. Sheets and towels: are provided. Deposit: none. Daily arrival from 14. 00 hours until 16. 00. Departure is to 10. 00 am. Unfortunately, no separate micro-cots are available.